This easy and delicious hummus recipe makes enough to eat now and freeze several cups for later. Mark loves hummus, and I've been wanting to make him some for years. The trouble is that it's impossible to find most of the ingredients locally. We found a can of tahini five years ago (and I assumed it was still good --- it was), but our grocery store doesn't carry chickpeas. When Mark saw some in the big city Sunday, he stocked up and I made a huge pot of hummus. 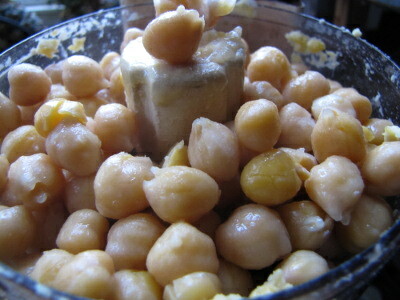 First, I soaked the chickpeas overnight and then cooked them for a few hours on the wood stove. Meanwhile, I roasted a lot of garlic and then started passing the rest of the ingredients through the food processor to grind them up. Here's the important part --- wait a day before eating! We tried some of the hummus right away and it was good, but the flavors really blend if you let your hummus sit in the fridge overnight. 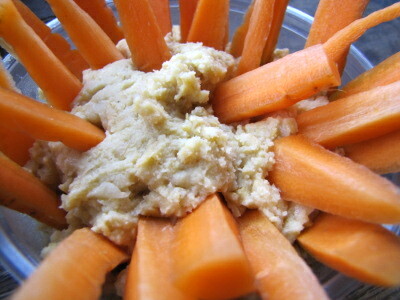 We like to eat hummus on carrot sticks, but you'll probably have your preferred serving method. Since this recipe makes about six cups, feel free to freeze some of it for later. Enjoy! Our chicken waterer keeps the flock from getting bored during long winter days. My brother-in-law's girlfriend introduced me to hummus. It's one of my favorite snacks that I don't have as often as I'd like. The local stores here don't carry chickpeas either, and the pre-made stuff is just too expensive for me to get regularly. I have replaced chickpeas with kidney beans and have enjoyed the outcome. I will be trying your recipy as my husband likes hummus too. I'm so glad our Tiny Kroger stocks chickpeas. We eat them a lot. Before my last trip to a big city (one with a Whole Foods and a Trader Joe's), I checked for recipes for tahini. It's much cheaper to buy sesame seeds than it is to buy tahini, and I can make as much as I need for a batch of hummus and not worry about whether the $10 jar I bought two years ago is still any good. Don't be tempted to grow your own chickpeas. Or if you do plant some and are successful, please let us all know what you did! I planted some last year and it was a total waste of a perfectly good row. The hulls were paper-thin. Many of the beans were shriveled and hard as pebbles, but most of the hulls were empty! 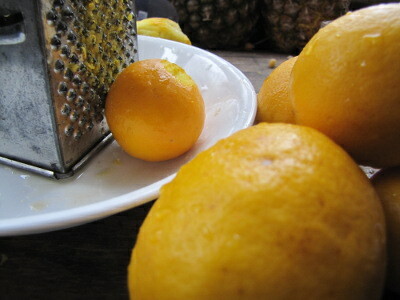 Edward --- It's certainly delicious! I like to add it to the table to round out a light meal. Debbi --- I didn't really have a way to get sesame seeds in large quantities either --- no way was I going to pay for the ones in the shaker in the spice department! But I do like the idea of starting with sesame seeds next time we find some. I'll have to keep my eyes open. Pantry shop has them in bulk. Food City in Wise and Weber City both have tahini in their International section. Haven't looked at St Paul or Coeburn. Also, peanut butter will work in a pinch. Maggie --- I'll have to put more pictures of vegetables on the blog. Glad to be subliminally changing eating habits. Bob --- You must be local! For some reason, we generally go the other two directions --- St. Paul for close stores and Abingdon for far away ones. But now that I know that Wise and Weber City have tahini, we'll have to stock up when we head that way!